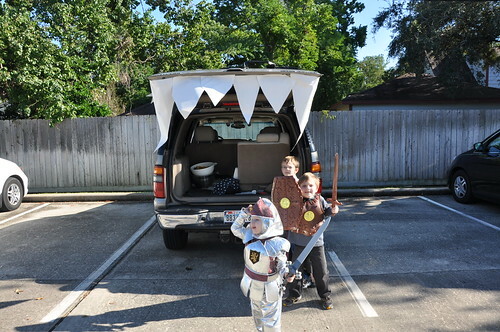 We created a cute vampire-fang-monster-mouth car decoration for the open back of a car at our trunk or treat. This was in 2009 – weren’t those boys so cute? They look so small to me when looking back just two years later. We had just moved to Houston in this picture and it was HOT for Halloween. The fangs were easy to create – a quick tip to make it even easier: we used an old, giant sticky note presentation board so they just stuck and we didn’t even have to tape them on anywhere to the car! Easy! Cute!